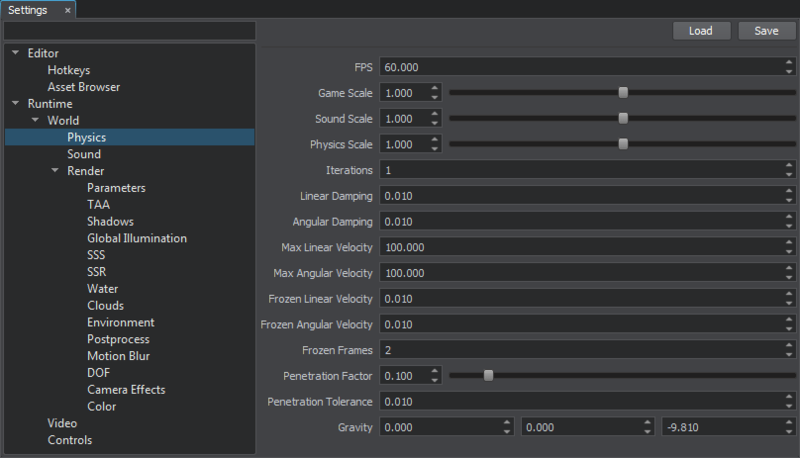 The Physics section of the Settings window allows you to adjust global physics-related settings: values set here will be applied to all physical objects in the scene. For more information on how to add physical properties to objects and set up physical interactions, see the articles in the Physics section. Fixed frame rate used to simulate physics. Physics frame rate is independent of the rendering one. Too high physics frame rate can cause rendering lags. If physics takes more than 40 ms, further calculations are skipped. Scale factor to speed up or slow down the physics simulation time, i.e how frequently physics is simulated (for example, slowing down of body's velocity). Only physics ticks are affected, while everything else is rendered at a normal speed. High number of iterations increase stability, but also result in a higher load. If physics takes more than 40 ms, next iterations are automatically skipped. Damping of objects' linear velocities. This value is added to the linear damping set individually for each object. The higher the value, the faster objects stop moving along the straight line. Damping of objects' angular velocities. This value is added to the angular damping set individually for each object. The higher the value, the faster objects stop their rotation. The maximum possible linear velocity. This value is compared to the maximum linear velocity set for each body, and the lowest value serves as a threshold to clip the actual linear velocity, if necessary. The maximum possible angular velocity. This value is compared to the maximum angular velocity set for each body, and the lowest value serves as a threshold to clip the actual angular velocity, if necessary. Linear velocity at which the object becomes frozen, if it keeps both of its velocities (angular and linear) lower than the freeze velocities. This value is compared to the Frozen linear velocity set for each body, and the highest value serves as a threshold to compare actual velocity with. Angular velocity at which the object becomes frozen, if it keeps both of its velocities (angular and linear) lower than the freeze velocities. This value is compared to the Frozen angular velocity set for each body, and the highest value serves as a threshold to compare actual velocity with. The number of frames, during which an object should keep both its angular and linear velocities under the specified level to become frozen. The factor used to define the reverse force of extrusion by unwanted objects tunneling. The minimum value of 0 means there is no extrusion by contact penetration. The maximum value of 1 means objects are extruded with the maximum possible impulse. Distance in units indicating how deeply one object can penetrate another to be extruded. Three coordinates of the vector used to define a gravity. It creates a world-wide uniform force field. Gravity is applied at the center of mass of each body (except for dummy body) to calculate its acceleration. Normally gravity vector should point downwards, i.e. have negative value along the Z axis. The higher the value along one of the axes, the stronger gravity presses in the specified direction.